We have done a study of a number of auroral substorms, observing them with both the Kilpisjärvi Atmospheric Imaging Receiver Array (KAIRA) and the Finnish Meteorological Institute's all-sky camera located nearby. KAIRA was measuring riometric absorption at 38.1 MHz and we used the 557.7nm optical data from the FMI camera. Substorms can be divided into three phases: the growth phase, the expansion phase and the recovery phase. 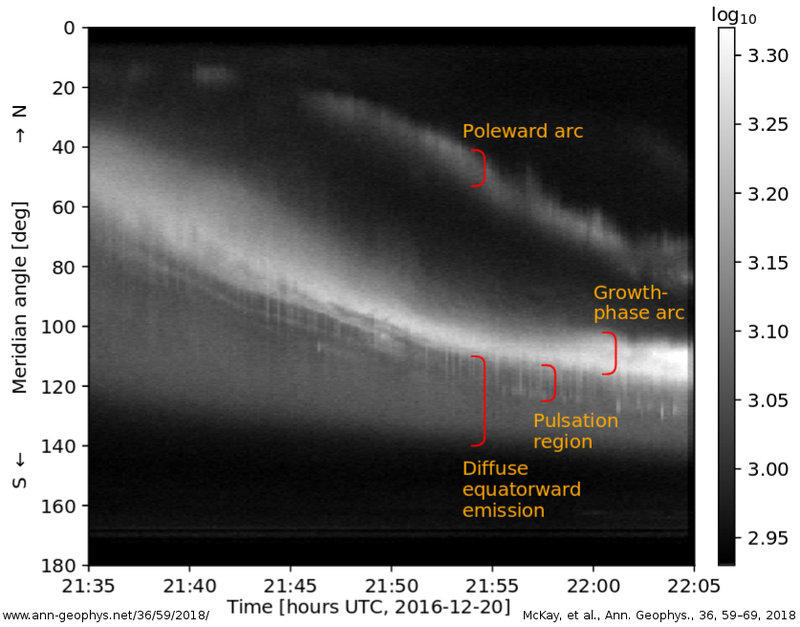 Here, we studied the long east–west band of aurora (known as the growth-phase arc), which forms at the start of substorms. We found that radio absorption was consistently south of the bright auroral arc and that optical pulsating aurora occurs in the boundary region between the radio absorption zone and the bright arc. Optical pulsating aurora is a well known phenomenon in the recovery phase of the substorm. This is where the most dramatic part of the auroral display has occurred and there is optical emission all over the sky. During this time patches of aurora flicker on and off. 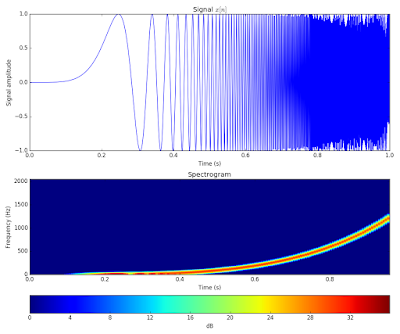 As part of the study of the riometric absorption, we noticed that there was optical pulsations in the growth-phase too. 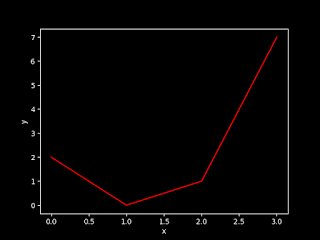 The figure is an optical keogram. There are two arcs, which are moving southward as time goes on. In the larger of the two, there is a soft, diffuse region to the south and a bright northern edge. The pulsating optical aurora appears in the boundary region between the two, showing up as faint vertical lines. In the second figure, you can see the whole substorm in context, with the magnetic, riometer (= cosmic noise absorption) and optical data. 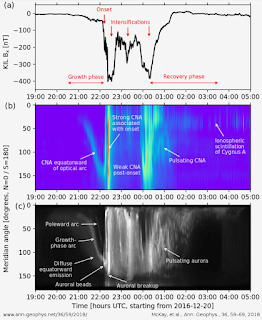 This shows the different phases of the substorm and puts into context the phase during which the optical pulsations were seen. The fact that pulsations are seen in a fairly localised region during the growth phase shows that the substorm expansion-phase dynamics are not required to closely precede the pulsating aurora. 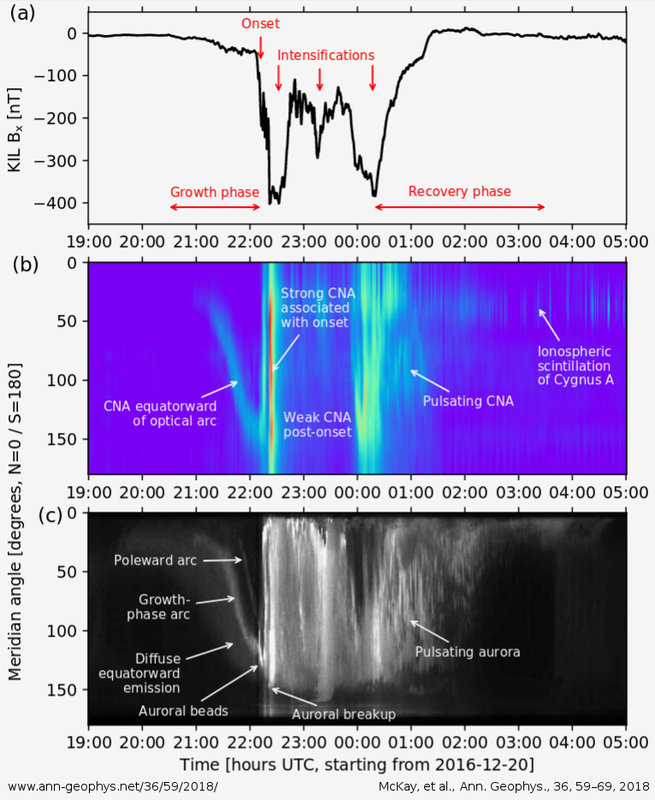 McKay, D., Partamies, N., and Vierinen, J.: Pulsating aurora and cosmic noise absorption associated with growth-phase arcs, Ann. Geophys., 36, 59-69, https://doi.org/10.5194/angeo-36-59-2018, 2018.